Charles, the eldest son of Queen Elizabeth II, is the 21st holder of the title, Prince of Wales, in the last 700 years. He is the heir apparent to the throne of the British monarchy and as such holds the title Duke of Cornwall. The Prince was born on 14 November 1948 at Buckingham Palace and christened Charles Philip Arthur George. A background of strong social interaction, military experience, and leadership positions has helped to shape the future king. His educational background includes a BA (honours) from Cambridge University having read archaeology, anthropology and history. It was in 1958 that he was created the Prince of Wales but it was not until 1969 that he took his first service appointment as Colonel-in-Chief of the Royal Regiment of Wales. He acquired sufficient military experience over the course of the years and eventually entered the Royal Navy (having learned to pilot helicopters) and also spent 6 months at the Royal Air Force College where he learned to fly jet aircraft. He left the Navy in 1976 but still, today, he holds high positions in the Royal Navy, Army, and Air Force. In the midst of his career in the Armed forces and trying to uphold his duties as a prince, there was time somewhere to fall in love. On July 29, 1981 in St Paul�s Cathedral the fairy-tale wedding of Prince Charles and Lady Diana Spencer took place. Their marriage however did not last long and following their separation in 1992, the Royal couple were divorced on 28 August 1996. The marriage fortunately lasted long enough for the couple to produce two popular Royal figures today; Prince William born on 21 June 1982 and Prince Harry born on 15 September 1984. Over the years the Prince had involved himself in many walks of life. His strong social awareness has helped lead his active interest in the life of the public. He has taken particular interest in working with and for young adults, the unemployed, inner city people, and the elderly. He also concentrates on the further development of the arts, the environment, conservation and architecture and also the regeneration of businesses and the preservation of Britain�s national heritage. Prince Charles has helped hundreds and thousands of disadvantaged people get their feet back on the ground. He has helped by donating small grants and loans to small businesses, in hopes to better the economy. He also strives to assist young people fulfill ambitions for themselves. 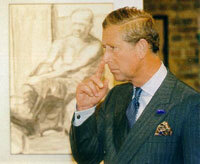 The funding for most of these projects comes from the Prince�s Trust, which was developed by Charles in 1976. It is worth millions and assists many disadvantaged people through education training and awareness to set up in business or obtain employment or further education. After years as the next in line to the throne, Prince Charles could be said to ready to succeed the Queen.